Each user who registers and makes an ‘azm’ claims his/her pixel and declares himself/herself as a ‘Nishan-e-Azm’. Each pixel thus represents a resolve to contribute to bringing Pakistan back to its rightful glory. As more and more ‘azms’ are made and more and more pixels filled in, a colorful picture of Minar-e-Pakistan emerges. People can also take part in contributing pixels via SMS. Sending an SMS with azmname to 5454 also unveils a pixel in their name. Blind Faith or Emotional Pull? 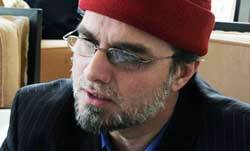 Recent debates, especially on facebook, regarding Zaid Hamid and his relations with a convicted blasphemer who died in jail almost a decade ago have certainly caught the Pakistani youth by surprise. They find themselves locked in an argument which is taking a heavy toll on their intellect and energies. On one side there are people who look upto traditional religious scholars with a good number of years and experience in the matters of religion while the other segment is quite wary of these sources and choose to follow their “Sir” Zaid Hamid. A closer look into the matter reveals that our youth can easily be generalized as passionate, emotional, irrational, impulsive, aggressive, vulnerable, know-it-all, mind guarded and above all frustrated. The description is equally valid for all the participants irrespective of their point of view. Ironic it may be both the parties well and truly are the future of Pakistan. These youngsters are enrolled in medical, engineering and management universities. I kind of get puzzled by the reaction of people on the Independence Day. The celebrations, the road blocks, parade of bikes with mufflers (silencers) stripped off, the disproportioned flags, the aerial firing at midnight, all in the middle of a comedy of crises never witnessed in the history of this country; the water crises, the electricity crises, the hike of sugar prices, the political crises, and what not … though the public rejoices on 14th of August 2009. Mushkelain itni pareen ke assan ho gain…? Or that was a blatant exhibit, a clear reminder to the world that we are still alive…? I doubt it, something is fishy here. Because the same crowd, probably, torched public and private property of hundreds of billions of Pak Rupees when one of their favorite politicians got assassinated in a suicide attack? Or when a European newspaper published the caricature of Prophet Muhammad (SAW)….? Or after some innocent illiterate children mistakenly sliced an Islamiat text book containing text from the Holy Quran? … The same crowd? … or different factions hidden within our skins, each of which revealing their ugly face when ever their so called “holy gods” are desecrated, not when they do the same with their own hand but by those who they don’t considered qualified for it! Pakistan is Not going to Collapse!!! These days you will see massive campaigns against Pakistan identifying its security failures, deal with Talibans and the ultimate fall by loosing Nuclear Weapons to the extremists putting every inch on earth in danger. Stop getting afraid of this massive propaganda campaigns spreading fear among the Pakistani people that Pakistan is going to collapse. Pakistan is not going to collapse!! It is being pushed towards wall by utmost pressure so that the nation becomes afraid. The best way to control a nation is when it is afraid. This is what the US politicians do with their own people. Dropping fear bombs that Al Qaeda is coming, Terrorists will replay 9/11 and what not to win elections. The point being criticized by Mr Tariq Fatmi in a recent show “Second opinion – April 20” that the State should not surrender to one stateless actor at gun point is nothing less of non-sense with all due respect. You need to understand that stateless actor pick up guns when the State does not do what it is required to do!! That is to save the lives and provide justice to its people. This is the failure of the government that Stateless actors are emerging….in form of Talibans or Mumbai attackers or Al-Qaida. It is the failure of the Muslim leadership collectively to respond to the Economic Terrorism done by the west to all the under privileged nations of the world especially the Muslim world since these are the countries with greatest wealth…..or a nation without leaders. I write this with great pride, Pakistan homeland to Muslims. I want to thank Mohammad Ali Jinnah for leading the Muslim nation and negotiating on their behalf, convincing the British as to why Pakistan is so important for Muslims living in India. Sentiments and emotions are important; Muslims of India never lacked it, they were failing to present their case objectively to the British. Jinnah was that bridge, determination, courage and his sincere efforts, strength of character forced the British to listen to him.